Loyola Blakefield is excited to announce Mike Finley as its new varsity rugby coach. Mike began his rugby career at the United States Naval Academy where he played for the USNA Rugby Club, primarily as a Prop. Upon graduating from Annapolis, he started teams on his first two ships, the USS COMTE DE GRASSE and the USS NEW JERSEY. While stationed on the NEW JERSEY, the club played in the Los Angeles Club League, but also managed to play other military teams from England, Australia, and New Zealand while deployed. Upon transferring to the Washington DC area in 1983, Mike joined the West Potomac Rugby Club, switching to a Wing Forward/Flanker. He played with West Potomac for five years. During that time, he also played for the Military District of Washington in several national military tournaments. Mike hung up his cleats when he married in 1990. 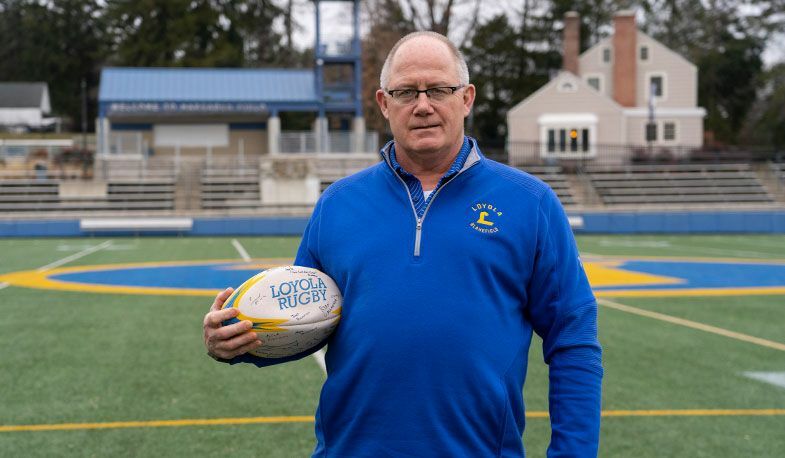 However, his love of the sport never faded, so when his children were older and he retired from the Naval Reserves, Mike became the first head rugby coach at Mount St. Joseph High School in Baltimore. He coached there for six years with winning records in five seasons. In his final year, 2011, he led the Gaels to an MIAA Championship and finished the season with a 15-1 record, only losing to Gonzaga College High School, which finished third in the nation that year. Mike has been married to the former Frances Donahue for 26 years and is the father of two Loyola Dons, Patrick ’11 and Daniel ’14, and daughter Colleen. He owns his own business in Millersville called Professional Community Management, Inc.